Shattering doubts, records, and the glass ceiling of comic-book blockbusters, Wonder Woman is a gigantic hit. It shouldn’t really come as a surprise, that people would rush to see a new superhero movie featuring one of the genre’s biggest household names. But going into this past weekend, plenty of analysts colored their projections with skepticism. Was the world ready to see someone other than a ripped dude administer the whams and pows? Putting this dubious dubiousness to rest, Wonder Woman opened to a cool $100 million here in the States, and an additional $122 million in foreign markets. In three days, it’s already surpassed not just expectations, but also its hefty $149-million budget. Wonder Woman’s victory is also a blow struck for diversity, behind and in front of the camera. $100 million is the biggest debut ever for a film directed by a woman, passing Sam Taylor-Johnson’s Fifty Shades Of Grey ($85 million) and Catherine Hardwicke’s Twilight ($69.6 million). Whether that results in more blockbusters directed by women remains to be seen; progress happens very slowly in Hollywood. 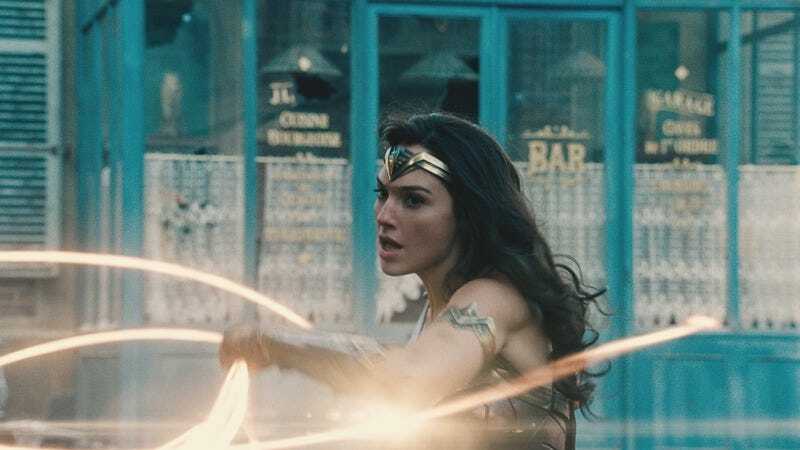 But the film’s success could also help put to bed the assumption that audiences don’t want female-fronted superhero movies—a misconception born at least partially from the failure of Catwoman and Elektra last decade, never mind that the problem there was probably that those movies looked (and were) terrible. Will we now get that Black Widow vehicle Marvel keeps insisting it wants to do if only it could convince itself? With Wonder Woman dominating the weekend and the wallets of most moviegoers, a different kind of superhero movie had to settle for a distant second place. Captain Underpants: The First Epic Movie opened with only $23.5 million—one of the softest bows ever for DreamWorks animation, despite reliable reports that it’s one of the studio’s better offerings. Still, the movie is said to be a lot cheaper than the average big-screen cartoon, which should ease the financial pain of getting absolutely crushed by Cars 3 and Despicable Me 3 later this month. Similar, Disney can probably shrug off the declining patronage of the new Pirates of the Caribbean, which slipped to third place, its grand domestic total now hovering around a disappointing $115 million. After all, the Mouse House still has the two biggest hits of the year in Beauty And The Beast and Guardians Of The Galaxy Vol. 2.